I have a few weaknesses when it comes to retail therapy. 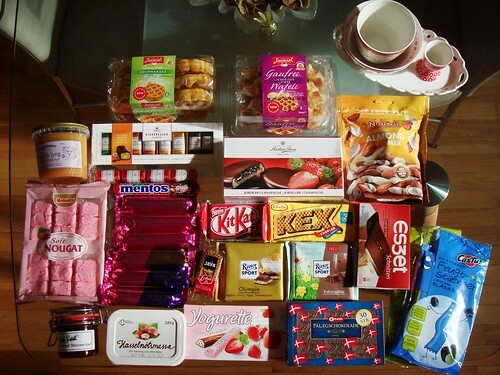 If you cannot already tell from the photo above, sweets of all kinds work their way from shelf to shopping basket easily. I take great pleasure in tasting the unusual, unique, local junk food I cannot find back home and love to share my sweet haul with friends and family. Click on the photo and hover over the original version on Flickr to see what exactly I bought! 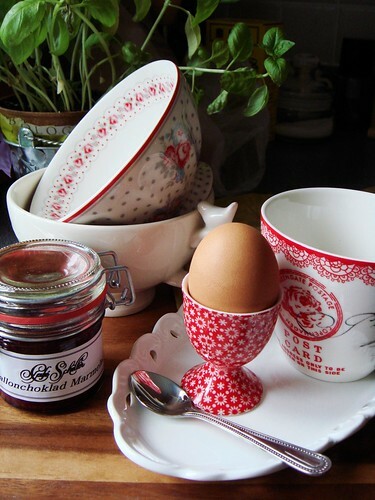 Some highlights include thin dark chocolate wafers to be enjoyed on morning toast, chocolate-covered marzipan in different guises, cola flavour Mentos, liege waffle from Belgium, Danish heather honey, and a little jar of raspberry chocolate marmalade that I cannot wait to try. My biggest regret is that I did not get a jar of Ovaltine Crunchy Cream when I had the chance in Germany. Given my recent obsessions with speculoo spread and malted milk powder, chances are I would fall head over heels for this treat. Alas, luggage weight restriction ruled the day [shake fist]. But my most prized shopping finds are a lot less ephemeral than any of the chocolaty treats. When I visited Copenhagen a year ago, I fell in love with the mix-and-match tableware by Green Gate Copenhagen while shopping in Strøget. There is something so girly and pretty about the whole collection that makes my heart flutter. Common sense helped me walk away from the store without any purchase because packing my bags with bulky breakables is just stupid. I returned a year later and only grew to love them even more. This time, I did not let opportunity slip by. Where there’s a will, there’s a way, right? 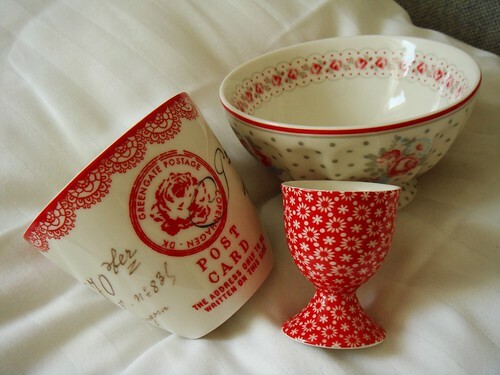 I bought two place settings of latte bowl, coffee cup, and egg cup. I also found the prettiest lace-edge oval plates at a big box Swedish supermarket for merely 26 SEK (less than $3.75 USD!). I am thankful that my dirty laundry made for excellent packing material. Every single piece survived the rigor of checked baggage to arrive home safe and sound. The romper/jumpsuit trend of the last few years left me feeling…old and left out. There is a certain impracticality and silliness that do not appeal to me. That all changed when I walked past a boutique in Strøget on my way to meet up with a friend. The mannequin at the store window sported a sleeveless jumpsuit by Second Female Copenhagen that draped in a very flattering manner. I tried on a dark slate gray version and couldn’t believe how leggy it made me look. I happened to be wearing my favourite black wrap cardigan, knee high socks, and combat boots. The whole outfit just clicked. It is now my favourite late spring look. Tomorrow I’ll show you my welcome home dishes, one savoury and one sweet. Of course I made good use of my latest shopping finds!